Currently, the propellers used in Cessna planes, etc. are generally made from metals or CFRP material. We achieved a lightweight material for fuel efficiency and enhanced strength to secure safety. As a result, we materialized a non-conventional propeller made from CFRP with a plastic honeycomb core. The essential feature of CFRP is its lightness and strength. Its specific gravity is around 1.8, which is about 1/4 of iron’s 7.8. Compared to aluminum’s specific gravity of 2.7 and glass fiber’s 2.5, CFRP is a significantly lighter material. In addition, the strength and the modulus of elasticity are excellent. Its ultimate tensile strength ratio (measured by ultimate tensile strength divided by its specific gravity) is about ten times as strong as iron. The modulus ratio (measured by elastic modulus divided by its specific gravity) is about seven times as large as iron’s. By using this CFRP we produced non-conventional propellers with higher fuel efficiency and higher safety. 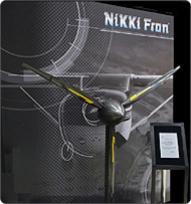 We collaborated with French manufacturers in Europe for the process of this propeller molding. In Japanese manufacturing, autoclave molding, vacuum bag molding, and hand lay-up up molding are generally used to form CFRP to various contours, though, these molding methods have demerits: molding time is very long, thus productivity is low. RTM molding, and VARTM molding with enhanced productivity have recently been introduced in Japan, however, Japanese molding technologies are lagging behind the state of the art technologies. Considering the present situation in Japan, we adopted the cutting-edge molding technology by working in close cooperation with French manufactures and materialized the molding method which enabled us to mold complicated contours and drastically shorten molding time.